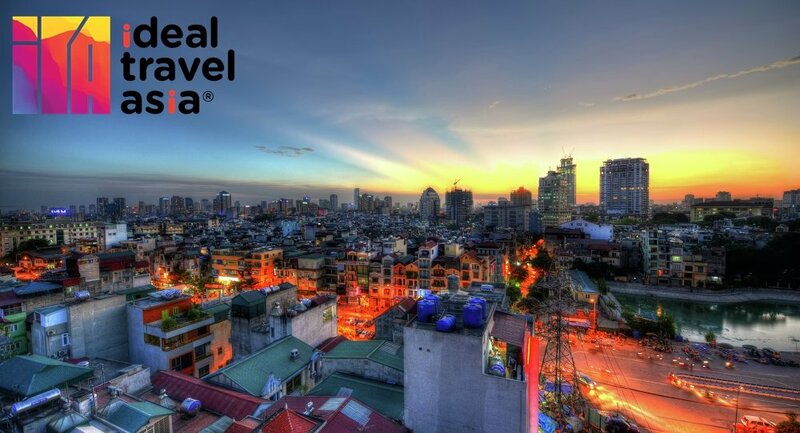 Have you ever come to Vietnam in particular and other ASEAN countries in general? There are absolutely many things that the Westerns would like to know about Asian cultures and beauty. Come to Northern Vietnam, you will never regret since there will be surprising things you would enjoy exploring and Idealtravelasia.com make sure that you will come back this part of Vietnam again one day! On arrival at Noi Bai Airport, you are met and transferred to hotel. Ha Noi, Vietnam’s capital, is one thousand-year-old city with peaceful lakes, French styled buildings, old quarter streets, tree-lined boulevards, brightly painted temples and pagodas. (If time permits) we enjoy a short cycles ride around the old quarter streets to see the different local ways of life. Overnight in Ha Noi. Today we enjoy a full day city tour starting with the Ho Chi Minh Complex. This famous site contains the mausoleum of the nation’s founder Ho Chi Minh, the Presidential Palace and the Ho Chi Minh’s house on stilts. Close to this complex is the One Pillar Pagoda, whose origins date back to the foundation of the city. We follow this with the Temple of Literature, which is well known as the first university of Vietnam and the impressive Ethnologic Museum, dedicated to Vietnam’s 54 ethnic groups. The beautiful West Lake and the History Museum with an excellent collection of artifacts illustrating the Vietnamese history are also a highlight of our trip. We visit these sights before continuing to the peaceful lake of Hoan Kiem. In front of this lake is the famous water puppet theater where we will see a fantastic performance. Overnight in Ha Noi. Transfer to Halong. Upon arrival in Halong Bay, we board our Junk for the overnight boat trip. After lunch, we begin our fantastic cruise in Halong Bay. The scenery is truly breathtaking and is continuously changing. This includes a visit to Sung Sot Cave, round over Tuan Chau Island, Dinh Huong Island, Ga Choi Island, Dog Island, Sail Island and a swim at Titov beach. Enjoy dinner on board while watching the sunset. After an early breakfast, we continue our cruise to visit Man‘s Head Island, Tortoise Island, Bai Tu Long Bay, Toad Island and Bai Tho Mountain. Upon our return to Halong city we have lunch on board and then board our transport back to Hanoi in the afternoon. Transferred to the railway station for a trip on the train to Lao Cai. Overnight on train. Pick up at Lao Cai station and transfer to hotel in Sapa, the town in the mist of cloud. As soon as arriving in this small quiet town you will be impressed by the romantic appearance of old French architecture and the streets filled with various kinds of hill tribes costumes up and down the hills. Have a shower and then order for breakfast. After a short relax, we start trekking to Laochai — Tavan. 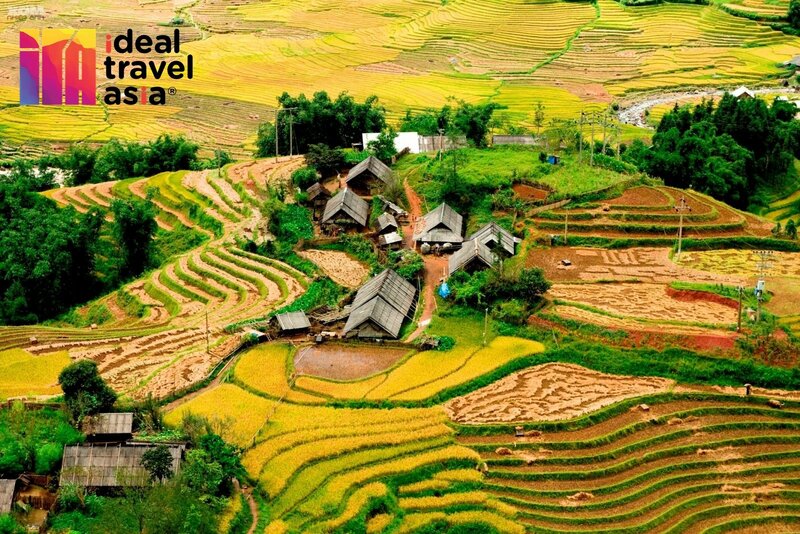 You will trek through remote villages of Red Dao, Black H’mong and Giay ethnic groups, pass incredibly beautiful valleys and rice — terraces. Have picnic lunch on the hill. After a 5-hours trek, have a short relax before our Jeep picks you up and back Sapa. Have dinner and enjoy Sapa at night with streets full of local brocade works and children in their colorful costumes walk in a group and sing together. The Cathedral is worth seeing, too. Trek for Cat Cat village of Black H’Mong Group where you could witness the daily life, the traditional customs, the brocading process made by small girls or old women. Here you could also see the French Power by Cat Cat Waterfall. Pass some root hang-bridges to back Sapa town. In the afternoon, continue our trip on road to Dien Bien. Overnight in Dien Bien. 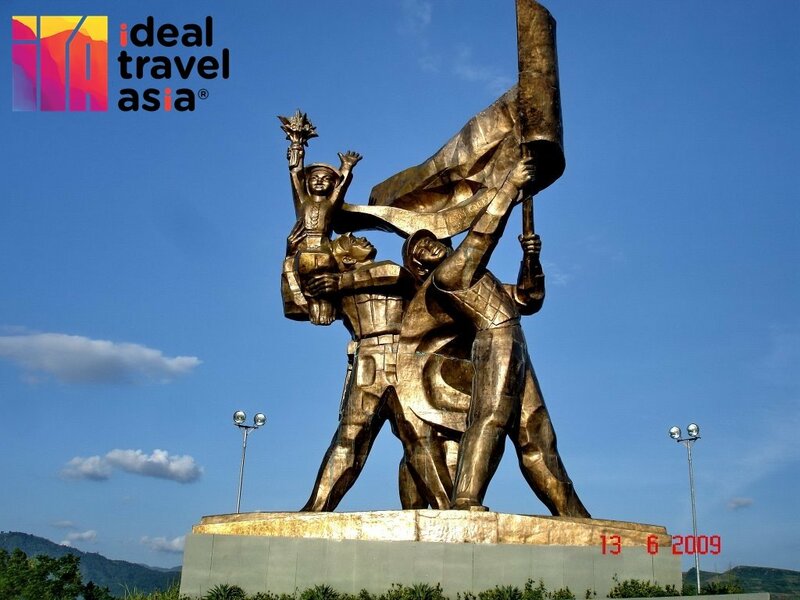 We spend the day around Dien Bien Phu visiting the former battlefields. It was here that the French planned to lure the Viet Minh, led by Ho Chi Minh, into the valley by sending 16,000 French troops as bait. The French, however, did not count on the brilliant leadership of General Vo Nguyen Giap who somehow managed to place the Vietnamese artillery on the surrounding ridges. From March until May 1954 the Viet Minh pounded the French positions until the French capitulated with the loss of 3,000 men. It’s estimated that the Viet Minh lost more than twice that number. Later you visit the headquarter of General Giap during the Dien Bien Phu campaign. We will have the chance to meet several of the different ethnic minority tribes here when we visit the villages of both the Thai and H’mong people. Tonight will be our second night in Dien Bien Phu. We have a morning at leisure and then we will transfer to the airport for flight back to Hanoi. After breakfast, we transfer to Ninh Binh province and have a boat trip through Tam Coc caves and visit Karst grottoes, Ninh Binh is considered as “Halong both on land and underwater”. After lunch, we visit Hoa Lu, the former capital of Vietnam. Drive back to Hanoi. O/N in Hanoi. Free at leisure till the time of departure for your flight.